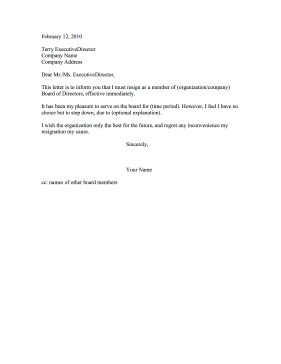 An explanation is optional in this resignation letter for members of a board of directors. This letter is to inform you that I must resign as a member of (organization/company) Board of Directors, effective immediately. It has been my pleasure to serve on the board for (time period). However, I feel I have no choice but to step down, due to (optional explanation). I wish the organization only the best for the future, and regret any inconvenience my resignation my cause.